A. Ownership is leverage. The most robust characteristic of renting, and why you pay a premium to retain freedom is because you have increased the frequency of decision-making—whenever you renew a lease. Make sure that your lifestyle, by which I mean job, will afford you the ability to leverage your time. B. The first-half of ownership feels more like renting anyhow. 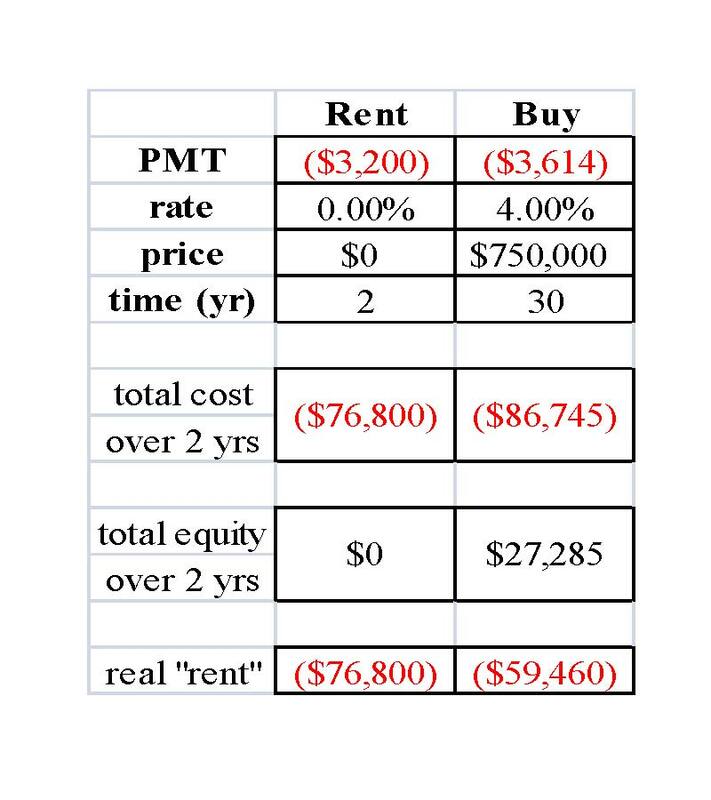 It generally takes fifteen to twenty years (with one re-fi) to actually pay more on the principle component than the interest on even today’s cheaper mortgages. 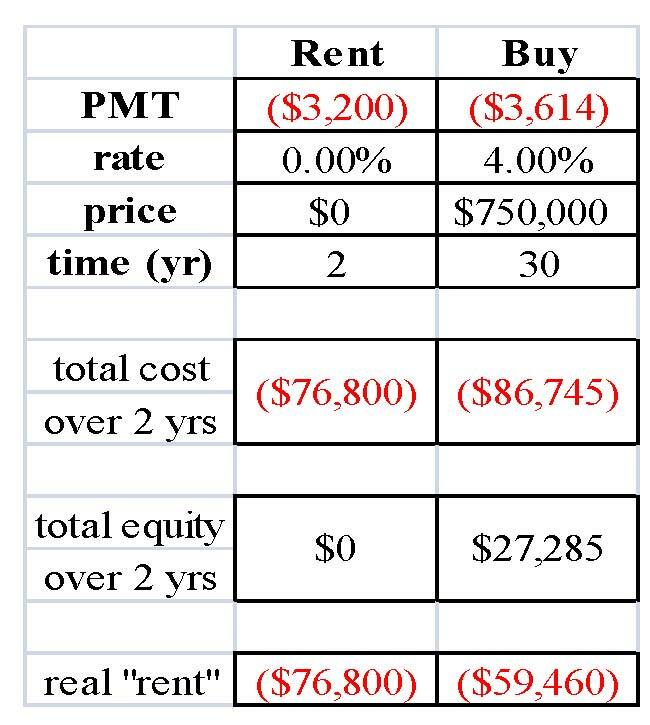 In the above example, recognize that even though the “total cost” is fairly comparable, off by ~$10K, the total equity built is only $27K, or 4% of the value of the property. 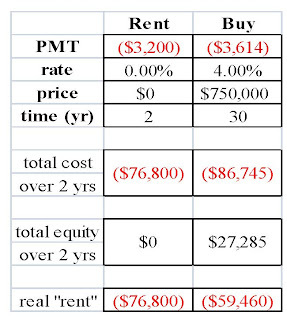 So the effective or economic-rent are the numbers you see at the bottom. In English: don’t buy a home without expectations to live there for at least eight to ten years. C. Measure the intangibles. The truth is that the home decision drives and is-driven-by dozens of factors! The best heuristic in my experience is to make the purchase after you know the constants in your life; don’t let the property be the dictator. Knowledge brings reassurance. It’s worth a conversation to sit down with someone to review all of this. Feel free to call me to discuss: 415-317-4546. 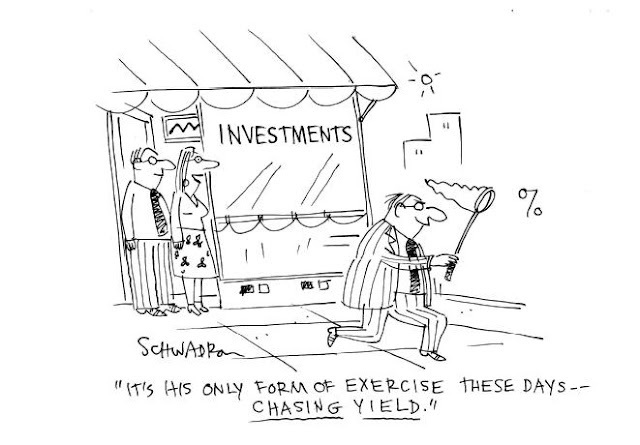 A very good friend of mine who is a money manager for high-net-worth individuals and families passed along this comic. I found it entertaining, and wanted to simply share it with my readers. There is a lot of truth to what the artist is illustrating (both in the stock / bond market and real estate realm) – I’ll let you draw your own conclusions. Enjoy!